The Milan Metro (Italian: Metropolitana di Milano) is the rapid transit system serving Milan, Italy, operated by Azienda Trasporti Milanesi. The network consists of 4 lines, identified by different numbers and colours, with a total network length of 96.8 kilometres (60.1 mi), and a total of 106 stations, mostly underground. It has a daily ridership of about 1.4 million on weekdays. The first line, Line 1, opened in 1964; Line 2 opened 5 years later in 1969, Line 3 in 1990, and Line 5 in 2013. A fifth line, Line 4, is currently under construction. The Milan Metro is currently the largest system in Italy for length, number of stations and ridership. The architectural project, by Franco Albini, Franca Helg and Bob Noorda, was awarded in 1964 with a Compasso d'oro, the most prestigious award for Design in Italy. The first project for the network in 1952. The first projects for a subway line in Milan were drawn up in 1914 and 1925, following the examples of underground transport networks in other European cities like London and Paris. Planning proceeded in 1938 for the construction of a system of 7 lines, but this too halted after the start of World War II and due to lack of funds. On 3 July 1952 the city administration voted for a project of a metro system and on 6 October 1955 a new company, Metropolitana Milanese, was created to manage the construction of the new infrastructure. The project was funded with ₤ 500 million from the municipality and the rest from a loan. The construction site of the first line was opened in viale Monte Rosa on 4 May 1957. Stations on the new line were designed by Franco Albini and Franca Helg architecture studio, while Bob Noorda designed the signage. For this project both Albini-Helg and Noorda won the Compasso D'Oro prize. The first section from Lotto to Sesto Marelli (21 stations) was opened on 1 November 1964, after 7 years of construction works. The track was 12.5 km (7.8 mi) long, and the mean distance between the stations was 590 m (1,940 ft). In the same year, in April, works on the second line started. Passengers on the network grew constantly through the first years of service, passing from 37,092,315 in 1965 to 61,937,192 in 1969. The green line from Caiazzo to Cascina Gobba (7 stations) opened five years later. During the 1960s and 1970s the network of 2 lines was completed, and both lines had 2 different spurs. In 1978, the lines were already 17.6 km (10.9 mi) and 23 km (14 mi) long respectively, with 28 and 22 stations. The first section of the third line (yellow), with 5 stations, was opened on 3 May 1990 after almost 9 years of construction works. The line opened just before the World Cup. The other 9 stations on Line 3 opened to the southeast in 1991, and northwest to Maciachini Station in 2004. In March 2005 the Line 2 Abbiategrasso station (south branch from Famagosta) and the Line 1 Rho Fiera station opened. The intermediate station of Pero opened on December 2005. A north extension of Line 3 to Comasina (4 stations) and a new south branch on the Line 2 to Assago (2 stations) opened in early 2011. The first stage of the Line 5, covering the 4.1 kilometres (2.5 mi) from Bignami to Zara opened on 10 February 2013. The 1.9-kilometre (1.2 mi) second stage, from Zara to Garibaldi FS, opened on 1 March 2014. The 7-kilometre (4.3 mi) third stage, from Garibaldi FS to San Siro Stadio opened on 29 April 2015, with some intermediate stations not in service at that time; as of November 2015, all the stations have been opened. The metro replaced several interurban tramroutes of the original Società Trazione Elettrica Lombarda (STEL) tramlines. In particular the Line 2 to Gessate. The only remaining suburban tram line to Limbiate is shortened to Comasina, the endpoint of Line 3. All the lines run underground except for the northern part of Line 2 and the Line 2 Assago branch. 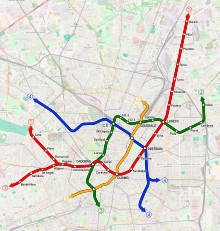 There are 7 interchange stations, each with 2 lines: Centrale (Lines 2 and 3), also Milan's main train station; Duomo (Lines 1 and 3), considered the center of the city; Loreto (Lines 1 and 2); Cadorna (Lines 1 and 2), city terminus for northbound suburban and regional railways; Zara (Lines 3 and 5); Garibaldi (Lines 2 and 5), also a major railway station; Lotto (Lines 1 and 5). Lines run in the Milan municipality for the 80% of the total length (93 stations). However, 12 other municipalities are served: Assago, Bussero, Cassina de' Pecchi, Cernusco sul Naviglio, Cologno Monzese, Gessate, Gorgonzola, Pero, Rho, San Donato Milanese, Sesto San Giovanni, Vimodrone. The network covers about 20% of Milan's total area. The track gauge for all lines is the 1,435 mm (4 ft 8 1⁄2 in) standard gauge. Most of the network has no platform screen doors, except for the newest Line 5, where screen doors are present in all stations and some stations on Line 1. Cascina Burrona station on line M2 Gessate branch, an example of a surface suburban station. The first 3 lines are heavy rapid-transit lines, with 6-cars trains, about 105 m in length. Line 5 is a light metro line, with 4-cars trains, about 50 m long. Line 5 is equipped with driverless trains. Lines 2 and 3 use overhead lines to supply the electric current to the train and are electrified at 1500 V DC. Line 1, electrified at 750 V DC, uses a fourth rail system, although the same line also supports overhead lines in some stretches and depots; this allows Line 2 and 3 trains to use Line 1 tracks to reach a depot placed on the line. Line 5 trains are supplied by a third rail system at 750 V DC, and the same system will be used on the future line 4. Most of stations are provided with LED screens showing the destination and waiting time of coming trains. In every station, a recorded voice announces the direction of every approaching train and, at the platform, the name of the station. While older trains have no on-train information, the new Meneghino and Leonardo trains and the driverless trains on Line 5 are equipped with displays and recorded announcements in Italian and in English. Since December 2009 all stations and trains of the Milan metro have full UMTS and HSDPA connectivity. Mobile operators TIM and Vodafone also provide LTE connectivity in all lines. A Milan urban ticket from Trenord (up left) and the same ticket from ATM (bottom left). On the right, an Itinero smart card: the name on the bottom left, the photo and the card number on the right have been covered. An urban single journey ticket costs €1.50, and is valid for buses, trams and suburban and metro lines inside the Milan municipality (urban fare limit). Other tickets are available, including 24h, 48h and night ticket. The cost of interurban tickets (for journeys outside the urban fare limits) depends on the journey and ranges from €1.90 to €4.10. Between 2004 and 2007 ATM introduced Itinero smartcard, a proximity card which can be charged with season tickets, replacing paper for this type of tickets. At the beginning of 2010, a new smartcard, RicaricaMi, was introduced. The new card can be charged up with credit and can be used for travel in place of magnetic paper tickets, on the model of London's Oyster card. Different fare plans exist. Milan metro lines can be accessed also with the regional integrated ticket "Io viaggio ovunque in Lombardia", as 1 to 7 days tickets or longer subscriptions using the smartcard "Io Viaggio". The service starts at about 5:40 am and ends at about 0:30. During Sundays and holidays service usually starts later and ends later, depending on the occasion. Headways at peak hours vary from 2 minutes on the Line 1 (central part) to 3 minutes on Line 3. On branch lines (of lines 1 and 2) the headway is usually double. A night service is operating since 2015 with buses. The bus service follows the same route and stopping at the same stations of the metro. The entire lines 1 and 3 and the urban section of line 2 (Abbiategrasso-Cascina Gobba) are covered by the service. The metro system is currently expanding. 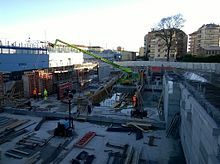 An extension of Line 1 from Sesto 1º Maggio to Monza Bettola, towards the city of Monza, is currently under construction. The track will be 2 kilometres (1.2 mi) long with an intermediate station at Sesto Restellone. The completion has been delayed several times, and is now scheduled for 2019. There is a proposal for a further 3 km extension of Line 1 to the west. An extension of Line 2 from Cologno Nord to Vimercate is planned. The section will be 10.8 kilometres (6.7 mi) long with 6 stations (Brugherio, Carugate, Agrate Colleoni, Concorezzo, Vimercate Torri Bianche, Vimercate). The track will be mostly underground (83%). Line 3 is planned to be extended to the south-east from San Donato to Paullo: 14.8 kilometres (9.2 mi) with intermediate stations in the city of San Donato, Peschiera Borromeo, Mediglia, Caleppio Cerca, Paullo and Paullo East, the first 3 being underground and the other on the surface. The project is currently on hold. The new Line 4 will run from the western suburb of Lorenteggio to the eastern side of the city to Linate Airport, and is expected to open in 2022. The line has been approved by the Italian Government in March 2006, and funded in November 2009. Preliminary prospections began in mid-2010, and construction started in late 2011. The construction of the whole line was approved by the city of Milan in November 2014. Line 4 trains will be completely automatic and driverless, employing AnsaldoBreda Driverless Metro trains as in Line 5. Line 4 will feature interchange stations with other M lines at Sant'Ambrogio (Line 2), Sforza/Policlinico (with an underground link to Line 3 through Missori or Crocetta), San Babila (Line 1),  and with suburban lines at San Cristoforo FS, Dateo and Forlanini FS. No interchange with Line 5 is planned. ^ a b c d "L'opera che ha fatto di Milano una grande metropoli" [The work that has made a great metropolis of Milan] (in Italian). Metropolitane Milanesi SpA. Retrieved 2015-06-20. ^ "Metropolitana di Milano, è il record di sempre di passeggeri in una giornata: oltre un milione". MilanoToday. Retrieved 16 November 2017. ^ a b c d e "ATM's History". ATM. Retrieved 2013-11-09. ^ "ATM in Figures". ATM. 10 February 2013. Retrieved 2013-11-09. ^ a b "La storia" [The history] (in Italian). ATM. Retrieved 2013-11-09. ^ a b c d "La storia della linea 1". Metropolitana Milanese Spa. Retrieved 31 October 2011. ^ Ogliari, Francesco (2006). Milano in tram : storia del trasporto pubblico milanese. Milano: Ulrico Hoepli. ISBN 978-88-203-3719-3. ^ a b c "La cronistoria della metropolitana di Milano". Cityrailways. Retrieved 8 November 2011. ^ "Milano Metro's first driverless line inaugurated". Railway Gazette International. 6 February 2013. Retrieved 6 June 2015. ^ "Milano extends driverless Line M5". Railway Gazette International. 7 March 2014. Retrieved 6 June 2015. ^ Sadler, Katie (1 May 2015). "Milan Metro Line 5 extension begins driverless operation". Eurotransport. Retrieved 6 June 2015. ^ Chiandoni, Marco (1 May 2015). 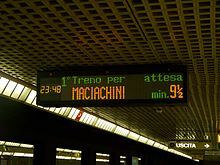 "Milan Line 5 extension opens". International Railway Journal. Retrieved 6 June 2015. ^ a b "Metropolitane a Milano - L'opera che ha fatto di Milano una grande metropoli". Metropolitana Milanese. Retrieved 10 February 2012. 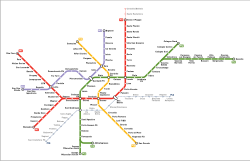 ^ see List of Milan Metro stations. ^ "Milan Line 5 The purple line connecting Garibaldi and Monza". Metropolitana Milanese S.p.A. Retrieved 7 August 2015. ^ "Telefonini in metrò: copertura al 100%". Azienda Trasporti Milanesi. Retrieved 26 February 2012. ^ a b "Biglietti urbani". www.atm-mi.it. Retrieved 2 October 2011. ^ "Biglietti interurbani". www.atm-mi.it. Retrieved 2 October 2011. ^ "Where to Stay in Milan". Archived from the original on 2 April 2015. Retrieved 17 February 2015. ^ "ANCHE MILANO HA LA SUA OYSTER CARD: ITINERO RICARICAMI". Partodamilano. Retrieved 2 October 2011. ^ a b "Orari e calendario ATM". Azienda Trasporti Milanesi. Retrieved 2 November 2011. ^ a b "Prolungamento linee Metropolitane e Nodo Interscambio Fiera". Comune di Milano. Retrieved 2 October 2011. ^ a b c "Metropolitana Milanese". Metropolitana Milanese. ^ a b c d "A GENNAIO 2021 LA PRIMA TRATTA, DEFINITE LE NUOVE OPERE FINO AL TERMINE LAVORI – Metro 4 – La linea Blu di Milano". www.metro4milano.it. Retrieved 8 April 2019. ^ "La Giunta approva delibera per M4". Comune di Milano. Retrieved 16 December 2014. Wikimedia Commons has media related to Milan metro.